In February of 2015, I had the pleasure of meeting renowned psychometrician and literacy researcher and author, Michael Milone. We were both attending the Learning Disabilities Association conference in California. I shared with him the newly-built beta version of InferCabulary, and he was extremely encouraging that we had stumbled upon a method that could help millions of children (and adults!) with not only vocabulary, but with critical thinking–improving performance not just in literacy and comprehension, but potentially in all areas of learning. It was with Dr. Milone’s intensive tutelage that we developed our educational construct, Semantic Reasoning, on which the Test of Semantic Reasoning was created. Additionally, we created the more robust, web-based tool, InferCabulary, which teaches K-13 students using semantic reasoning skills. Every step of the way, Dr. Milone has been an encouragement to us, and has lent his decades of experience to helping us share this unique construct with others. Please read his excellent description of this construct printed in Readibility’s Fall 2017 issue that Deena Seifert and I stumbled upon when we knew we needed a new approach! Nothing to date had worked to teach vocabulary words to my 8th grade student. She simply could not learn vocabulary through using language as the primary modality, due to her language deficit. 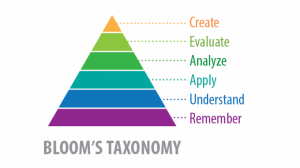 We like to say we flipped Bloom’s Taxonomy around a bit, as we showed her how she could use critical thinking (the top of the pyramid) as a way to deeply learn nuanced word meanings instead of using rote memorization.